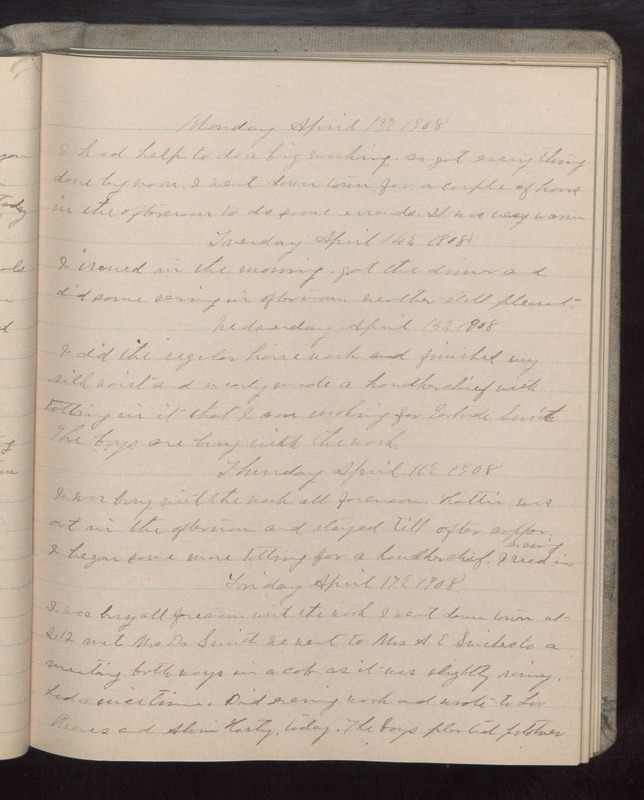 Monday April 13 1908 I had help to o a big washing, so got everything done by noon. I went down town for a couple of hens in the afternoon to do some errands. It was very warm. Tuesday April 14 1908 I ironed in the morning, got the dinner and did some sewing in afternoon. Weather still pleasant. Wednesday April 15 1908 I did the regular house work and finished my silk waist and nearly made a handkerchief with tatting in it that I am making for Gertrude Smith The boys are busy with the work. Thursday April 16 1908 I was busy with the work all forenoon. Hattie was out in the afternoon and stayed till after supper. I began some more tatting for a handkerchief. I read in evening. Friday April 17 1908 I was busy all forenoon with the work. I went down town at 2.12 met Mrs Dr Smith we went to Mrs A.E. Swishers to a meeting both ways in a cab as it was slightly rainy, had a nice time. Did evening work and wrote to Lou Reeves and Alvin Harty, today. The boys planted potatoes.